Yesterday, around 4:15, I was summoned upstairs and outside to watch what instantly became my favorite Nashville tradition - The Elephant Parade! Coatless, I stood in the 38-degree weather with my co-workers to watch the precious elephants walk up the street! You see, the circus is in town, and the elephants are transported via train. 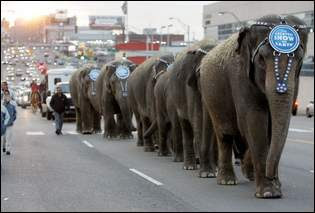 They were unloaded from their car yesterday afternoon, then paraded the short distance from the train tracks to the Gaylord Entertainment Center, where the circus takes place. I love how they hold trunks and tails. SO CUTE! I think I want one. I LOVE THE CIRCUS!! How fun!! I don't think they did that in B'ham when I was growing up. I used to LOVE getting a snow cone at the circus and keeping the clown cup. Random, I know.